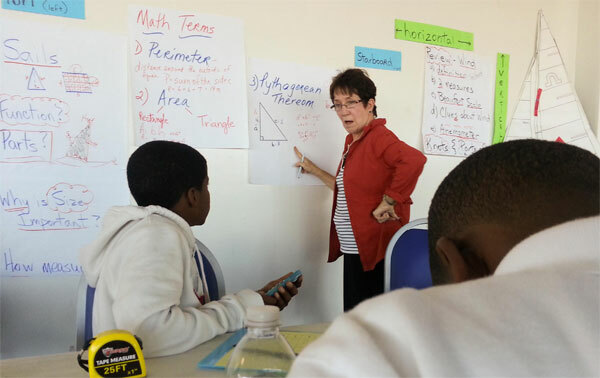 Celia Oprinovich, center, teaches students from an East Chicago Middle School during a session of the STEM-based curriculum provided by Indiana Sailing Association. Indiana Sailing Association Volunteer and Curriculum Coordinator Celia Oprinovich was among 9 candidates from around the country who were invited to attend a special training session with U.S. Sailing in late April. U.S. Sailing is a recognized leader in sail training and certification and Oprinovich attended the special session to be certified to teach the REACH curriculum, U.S. Sailing’s STEM-based sailing curriculum. The workshop was only available to people who had previously attended U.S. Sailing’s REACH Workshop and had taught the STEM curriculum. Oprinovich’s training helps to build a stronger foundation for the Indiana Sailing Association to continue developing the STEM-based curriculum and academic enrichment opportunities for local students in East Chicago.